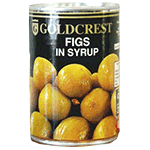 Tinned figs in syrup. soft sweet fruit, full of small seeds and often eaten dried. Fresh figs are delicious and often jam and chutney is made from them. Produce of South Africa.